Superstorm Sandy is expected to cost a staggering $50 billion, with as many as 200,000 claims for wind damage and 20,000 claims for flood damage filed by consumers. The sooner those claims are filed the better, but that doesn't necessarily mean everyone will get what they ask for. Payments by private insurers for wind damage to homes and business properties from Hurricane Sandy will likely exceed $10 billion dollars. Flood claims paid by the National Flood Insurance Program (NFIP) will be at least $8 billion dollars and will likely exceed $10 billion, exhausting the NFIP's existing $4 billion in payment authority. To make up this shortage, FEMA is authorized to borrow up to $500,000 with an additional $1 billion available with Presidential approval. "Even combined, these borrowings will be insufficient to pay all flood claims related to Hurricane Sandy," said J. Robert Hunter, Director of Insurance for CFA. Whether it's due to fund shortages or not, the reality is that a lot of people will either see their claims flat out denied, or get checks for far less than they'd hoped for. "Once the insurance company tells you the reasons for its action, it cannot produce new reasons for denying payment or making a low offer at a later time. You have locked them in -- a major advantage for the consumer." All sorts of things can go wrong with claims. You might not realize you've agreed to pay a deductible, which could account for a missing chunk out of your claim (remember that in some states, insurers have been ordered to drop deductibles for hurricane coverage since Sandy was downgraded to a tropical storm). Your insurer also might have slipped in new or ambiguous policy limitations you weren't aware of, which could be cause to call in help from an attorney. • Complain to senior staff in the insurance company. Use the records you have kept since the claim process began. The more serious the insurance company sees that you are in documenting how you were treated, the more likely they will make a more reasonable offer. • Complain to your state insurance department. All states will at least seek a response to your complaint from your company. A few states may actually intervene on your behalf with the insurance company in clear cases of bad claims handling. It is important to dispassionately present your side of the story, using the notes you have been taking. • See a lawyer. Remember, the notes you took are vital. In addition to an award covering your claim, if your treatment was particularly bad, the courts in many states will allow additional compensation when the insurance company acted in "bad faith." The devastation wrought by Hurricane Sandy is a good reminder that the strength of a storm is less important than where it makes landfall. Despite its enormous size, it was classified as only a Category 2 storm at its peak, and by the time it made landfall in the Northeast, it had been reclassified as a "post-tropical storm" (a designation that will force insurers to pay more in claims than they would have for a storm classified as a hurricane). 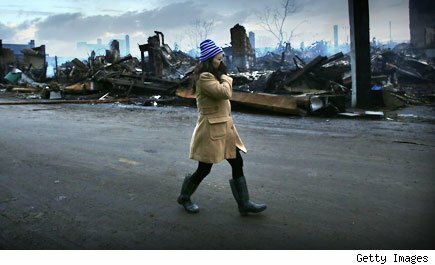 Hurricane or not, though, Sandy's landfall near New York City and other major population centers in the region immediately vaulted it onto the list of the most expensive storms in the nation's history. While the first wave of cleanup and recovery continues throughout the region, there's little doubt that the massive flooding and wind damage associated with Sandy will ultimately cost tens of billions of dollars, to say nothing of the human toll. Click through our gallery to find out how Sandy stacks up to other devastating Atlantic storms. * - Costs adjusted to 2010 dollars on basis of U.S. Dept. of Commerce Implicit Price Deflator for Construction. The storms from 2011 and later are not adjusted. The National Climatic Data Center (NCDC) rates Hurricane Katrina's damage at $133.8 billion 2007 dollars. U.S. areas affected: Florida(Panhandle), Georgia, Carolinas, Northeastern U.S. This June 23, 1972, photo shows people in Harrisburg, Pa., being rescued by boat from their homes after Hurricane Agnes caused the Susquehanna River to overflow its banks, leading to heavy flooding. A South Carolina man displays a photograph of his house taken before Hurricane Hugo destroyed it in September 1989. Rosa Machado (center) of Lafite, La., walks through waist-deep flood water as a neighbor's trailer burns following Hurricane Rita's late September passage through the area. Hurricane Irene crippled 10 states during its slow climb up the Eastern Seaboard, causing massive flooding and power outages. The brutal storm made landfall in North Carolina and traveled to Maine. Billy Stinson (C), his wife Sandra Stinson and daughter Erin Stinson (R) comfort each other as they sit on the steps where their cottage once stood before it was destroyed by Hurricane Irene on Aug. 28, 2011 in Nags Head, N.C. The cottage, built in 1903 was one of the first vacation cottages built on Roanoke Sound in Nags Head. Stinson had owned the home, which is listed in the National Register of Historic Places, since 1963. "We were pretending, just for a moment, that the cottage was still behind us and we were just sitting there watching the sunset," said Erin afterward. At least 13 people were killed when Hurricane Charley left a path of destruction across Florida then continued north and struck the Carolinas. Pictured: Debris from homes destroyed by Hurricane Charley litters the waterways that surround much of Punta Gorda, Fla. Residents of Pensacola Beach, Fla., pass by an SUV half buried in sand as they walk back to their homes on Sept. 22, 2004, to inspect the damage caused by Hurricane Ivan. After striking Mexico from the Caribbean Sea, Wilma turned northeast, strengthened over the Gulf or Mexico, and made landfall near Cape Romano, Fla., on Oct. 24 as a Category 3 hurricane. The eye crossed the Florida Peninsula in less than five hours, and it moved into the Atlantic just north of Palm Beach as a still forceful Category 2 hurricane. Pictured: A public phone is surrounded by flood waters near a block of hotels as Hurricane Wilma lashes Cancun, Mexico, on Oct. 21, 2005. Flood waters from Hurricane Ike were reportedly as high as eight feet in some areas, causing widespread damage across the coast of Texas in September 2008. Pictured: A home in Gilchrist, Texas, is left standing among debris left by Hurricane Ike. Andrew came ashore in Florida near high tide, pushing a 16.9 foot storm tide (the sum of the storm surge and astronomical tide) into Biscayne Bay, a record for the southeast Florida peninsula. U.S. Areas Affected: Connecticut, D.C., Delaware, Florida, Maine, Maryland, Massachusetts, New Hampshire, New York, New Jersey, North Carolina, Ohio, Pennsylvania, Rhode Island, West Virginia, Vermont, and Virginia. Pictured: NEW YORK, NY - OCTOBER 29: Rising water, caused by Hurricane Sandy, rushes into a subterranian parking garage on October 29, 2012, in the Financial District of New York, United States. Hurricane Sandy, which threatens 50 million people in the eastern third of the U.S., is expected to bring days of rain, high winds and possibly heavy snow. New York Governor Andrew Cuomo announced the closure of all New York City will bus, subway and commuter rail service as of Sunday evening. Katrina unleashed torrential rains and a potent storm surge that led to disastrous flooding that left about 1,600 people dead, destroyed thousands of homes and marred the presidency of George W. Bush, whose administration was severely criticized for its handling of the crisis. Pictured: President Bush (center) tours the devastation in New Orleans with Mayor Ray Nagin (right), Louisiana Gov. Kathleen Blanco and Vice Adm. Thad Allen. Pop Quiz: Who Gets Benefits?